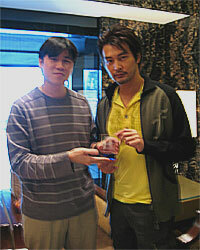 (above) Andrew Lin with LoveHKFilm webmaster Ross Chen, and the LoveHKFilm Award for Most Underrated Performance. "That was my first film in Hong Kong, my first major lead. We shot in Hungary. It was the first time I played a big villain. I had to do a lot of fighting, a lot of martial arts. What's interesting is a lot of people remember me from this film. When they talk to me, they actually ask me about this film. I guess it was because it was my first film, so it made some impact on them." "That was my third film and the first time I had to do love scenes. They were with Almen Wong. I was quite nervous. It was a big jump, in terms of acting. I was starting to learn how to act through my body. The story is okay. Not that good, but not that bad either." "When I first talked with the directors, the script was really good. But when we got to Singapore, the production company there, the stuff they promised -- the locations -- weren't available. So we had to change the script in Singapore right away. So, the second half is not as good as the first half. The first half was planned for a long time, but the second half was planned in only a few days." "What I really remember is my costume. I hated it. I was wearing cowboy boots and a cowboy shirt. I don't know why. I guess the costume designer thought that since I was playing an American government agent, I should be in a cowboy outfit. An American cowboy -- they made that connection. I don't know why, but I was a cowboy in that film." "I received no direction [for playing his famously over-the-top villain in the film]. I was sick and tired of playing villains. I wanted to play something different. Instead of playing a cool, sharp-looking villain, this time I wanted to be do something else. That was the variation I came up with." "I'm in The JC Group, so I was obligated to play a role in the film. I played Cherrie Ying's husband, Baby Matthew's father. There's not much to talk about really. It was a five-day shoot for me, but they cut most of my scenes so it became like a two-day shoot. The first scene is me and Cherrie in the hospital with her giving birth. That scene is actually longer, you can see the whole process, from the beginning of her pain to the baby's birth, but they cut it. It's actually pretty funny." "There was also a scene about me and Cherrie in the house, very worried about the missing baby, but that was cut out too." "Actors need to make money." Previous to this meeting, LoveHKFilm.com has never officially met with any HK Entertainment personalities. We're glad that Andrew Lin accepted to meet with us because because he was honest and down-to-earth, plus he wasn't angry with us for what we said about Wife From Hell. The circumstances for this happening were circuitous and rather coincidental, but here's the short version: somehow Andrew Lin heard of the LoveHKFilm Awards and posted it on alivenotdead.com. 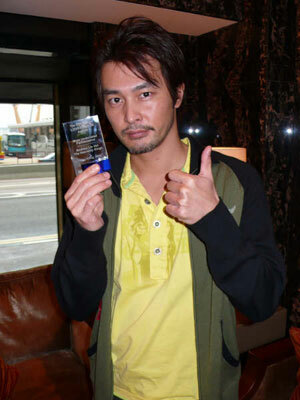 Coincidentally, one of the Webmaster's friends knows Terence Yin, who of course knows Andrew Lin. A week or so later, we managed to put this thing together, which in total required eight phone calls and an extra week to prepare the first ever physical LoveHKFilm Award, a blue-and-clear glass bauble that turned out a lot nicer than we thought it would. The long version of this story would take an extra three pages so we'll spare that for a later day. Sean Tierney, Winnie Chan, Paul Hong and of course Andrew Lin. 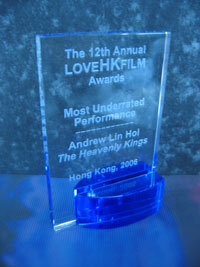 In an unexpected event, actor Andrew Lin met with LoveHKFilm.com staff to accept the LoveHKFilm Award for "Most Underrated Performance", earned for his underappreciated work in the 2006 mockumentary The Heavenly Kings. The film was also among LoveHKFilm.com's "Top Ten Films of the Year", announced on February 22, 2007, as part of the 2006 LoveHKFilm Awards. The "Most Underrated Performance" Award is given in recognition of a good performance by an actor that was not noticed or appreciated by the media, award-giving bodies, or the general audience. In The Heavenly Kings, Andrew Lin played himself, but not in an exaggerated or expected manner. Lin was sympathetic and surprisingly likeable as a seemingly humble, yet quietly vain actor, who uses his friends as a way to boost a flagging acting career. The role brought an extra layer to the film's entertainment industry satire, painting artists as not just unfortunate victims, but also conniving opportunists. Andrew Lin graciously met with LoveHKFilm on March 18th, 2007, at the Mandarin Oriental Hotel in Central, Hong Kong, where we shared a cup of coffee and talked about his career, The Heavenly Kings, and the Hong Kong entertainment scene in general. Lin first gained notice in the 1998 Ching Siu-Tung actioner The Blacksheep Affairs, playing the villain opposite Zhao Wen-Zhou and Shu Qi. The role launched a promising career, but unfortunately, the late nineties also saw a crisis for the Hong Kong film industry, with declining attendance, piracy, and reduced investment preventing actors and filmmakers from producing the variety and output of films that drove the industry to international prominence in the late eighties and early nineties. As a result, many actors and filmmakers were marginalized, never getting the opportunities they might have received if the industry were more robust. One could say Andrew Lin's career fell into that category. Though Lin displayed plenty of range in smaller films like Julian Lee's The Accident or Derek Chiu's Love Au Zen, he was frequently cast as the bad guy in larger, more commercially-driven productions. In the biggest films with the most exposure, Lin usually had to be the baddie opposing the top-billed star, be it Aaron Kwok (2000 A.D.), Louis Koo (GOD.COM), or fellow Alive member Daniel Wu (Naked Weapon). To general audiences, Andrew Lin was usually the heavy. Lin was able to control his destiny a bit for The Heavenly Kings. Lin worked with friends and fellow actors Daniel Wu (who also directed), Terence Yin, and Conroy Chan on the project, and the four got to play themselves -- with the added twist that they could play with their own image. "We didn't know what to do with my character at first," Lin recalls. "Terence's personality is a bit stronger, he's a party animal, and the press always writes about him that way. So Daniel tried to use that and exaggerate it. But for my character -- my life in the business has been sort of subtle, so we tried to paint a contrast to the types of characters I played before, I've played a lot of villains and baddies, so I wanted to play the reverse." Lin did play the reverse. His character, "Andrew Lin", is portrayed as a shrewd, calculating, yet somewhat pathetic actor who entreats his buddies to start a boy band simply to save his failing career. "I wanted to play a small man, someone who's selfish, who's very aware of what he's getting out of things. You know, just something different, something totally different than what I've played before." Lin succeeded, though people came to confuse Andrew Lin with "Andrew Lin". "People think a lot of parts [of The Heavenly Kings] are real. For example, the part about my father -- most people see that as real. But they never really came up and asked me about it. The way I said it in the film, it sounded like my father had passed away already. When I tell them that the scene isn't real, the reaction is, 'Oh, really?!?'" Lin adds, "My father is alive, by the way." The Heavenly Kings gave Lin and his fellow Alive members a way to critique Hong Kong's famously gossip-fixated media. For Lin, who hails from Taiwan, the Hong Kong media was a bit of a culture shock. "Hong Kong and Taiwan are very different. I started out in Taiwan. In Taiwan, the press works differently than in Hong Kong." "For example, it's like today [this meeting]. Your management company would write an article about you and send it to the press, and if the reporters like the subject, they'll print it tomorrow. But in Hong Kong, they really don't want to print something that serious. If you caught me going out with this other actress, it would be on the front page about this big." Lin indicates a six-inch space. "But our article [about this meeting] would be about this big." Lin indicates a space of about two centimeters. "So that's something I've learned in Hong Kong: the media is very much different from Taiwan." Lin sighs, "But the worst thing is that [the media in] Taiwan is starting to learn from Hong Kong." Lin still has an affection for Hong Kong movies, but he admits that he doesn't watch so many anymore. "Since I'm working as an actor in Hong Kong, I can pick up the quality of the film just by looking at the production. It's really easy if you're in the business. There's value in commercial film, but I'm kind of disappointed in it now. It's so much about the business more than the art itself." "Before when we watched Hong Kong Films, they was commercial, but they were still pretty good. There was still some art value to them. Now it's all about the business side, the box office side. Now even the genre or the story has to appeal to China. Everything's so formulated." Reduced output and financial considerations have hurt some of Lin's chances at roles. "The worst part is they use the same actors. The investors want someone who can get box office numbers. It doesn't matter if you're a good actor or not. Look at Lau Ching Wan. He's not acting anymore, I don't know what's going on. He does one film a year. He's working less and less." "But as an actor, when I get a job, I get paid, so I can't complain." Lin's experience as an actor -- and the frustrations that come with it - - was one of the driving forces behind The Heavenly Kings. "The actor is very passive," Lin relates. "We have to wait for a job. Unless it's something like this [The Heavenly Kings]. We invested in it so we could make a film to express how we felt." The Heavenly Kings certainly did express what Lin and his friends felt, delivering a satirical and sometimes scathing look at the Hong Kong music industry and the ridiculous media attention that comes with it. The film struck a chord with a small audience, but the general public didn't turn the film into anything resembling a bonafide box office hit. Lin states that this was expected. "The film wasn't for the general audience. The film wasn't very commercial, so the box office wasn't that great. I don't think that most of the Hong Kong audience have seen the film yet." Lin is adamantly positive about the experience, however, placing art firmly above commerce with The Heavenly Kings. "We made this film for ourselves. We've kept our feelings in for so long, and we wanted to express it by making a film. When we started out, we never thought about making any money out of it. We're not in debt. We made some money, but not that much. That wasn't the primary goal, to make money." The creation of Alive, and the critical success of The Heavenly Kings did create some new opportunities, however. "Since we made this film, our production company is still there," Lin says. "We're thinking about doing more films later." "Actually, we [the four members of Alive] shot a few short films for a commercial. We're spokespeople for a new drink, and we got to shoot four 5-minute short films. We came up with four different stories for the four of us." Like with The Heavenly Kings, Lin and his crew did things their own way. "Instead of shooting a commercial about me holding a drink, we wanted to shoot something different. We have a slogan, 'what's your color?' The film is about what is my true color. What do I want to do with my life?" Lin promises that the answer -- which will be unveiled when the commercials premiere later in 2007 -- will surprise and entertain people. From all indications, Lin's short film promises to channel the same irreverent, shoot-from-the-hip filmmaking verve that made The Heavenly Kings one of 2006's most enjoyable films. Given the last decade's dearth of creativity, Hong Kong Cinema could use a few more movies like this. The "Andrew Lin" in The Heavenly Kings may be a selfish guy looking only for his own gain, but the real Andrew Lin is not a small man at all. Recently, Alive performed at the Hong Kong Film Awards, using their performance slot as a way to announce the "death" of Alive, as well as promote local artists, including bands Hardpack and Audio Traffic. The boys of Alive also just updated their website, www.alivenotdead.com, transforming it from a promotional site about Alive into "an online artistic community for artists and fans to share their personal expressions of inner creativity and passion." Alive may be dead, but their bohemian dream lives on. 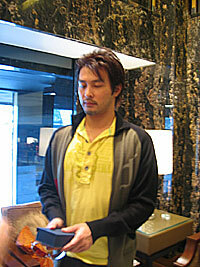 (above) Even more photos of Andrew Lin. You'd be surprised at how many of the photos we took aren't usable.